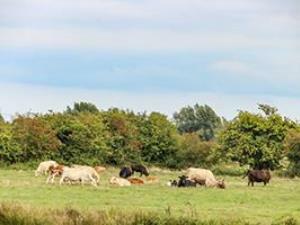 Voted 2013's Farm of the Year, College Farm has the perfect glamping Norfolk / Suffolk border location on the southerly tip of the Norfolk Broads. It's just a half-hour's drive to South Norfolk's well-known beaches and coastal towns, such as Southwold and Walberswick. The Daniels love to show - and bottle feed - their lambs when they have them, along with Filly the horse, the herd of cattle grazing on the marshes, and the chickens at the top of the Feather Down field. Don’t miss the farm tour on which you can meet them all! Unfortunately, however, dogs cannot be accommodated. Enjoy a wander on the marshes or by the river, and help out with looking after the lambs. The communal horse grooming session is always a hit. The hay barn is a paradise for energetic children, with bale jumping, tunnelling and scope for endless imaginary games. There is a trampoline too, next to the climbing frame, swings and slide. One appreciative visitor wrote "their attention to detail was faultless and touching”. In just one example of this, College Farm offers a toilet and shower with access for disabled people too. Lucy and Marcus love getting to know all their guests, wanting each to have a Feather Down experience they will remember for a lifetime.